Improving professional learning cultures and systems among teachers is a long-term, sustainable approach to addressing persistent challenges of student learning. CEL's approach to professional learning, which develops teacher collective efficacy, stands in contrast to traditional investments in teacher professional development that have not consistently yielded results for students. Our methodology ensures that your investment will be aligned with ESSA’s requirement for professional learning activities that are sustained, intensive, collaborative, job-embedded, data-driven and classroom-focused. CEL will work with you to develop the leadership skills necessary to create and sustain effective school-based professional learning cultures focused on (1) problem-solving, (2) collaboration and (3) getting better. These three micro-cultures exist and interact in schools where there is collective efficacy and improvement in teaching practice. Your investment in developing collective efficacy will transform teacher professional learning in your school setting so that it can become part of the fabric of the daily life of educators and transform learning for students. We engage your team in an initial needs assessment documenting the current state of professional learning in your school and the articulated problems of student learning. We work with you after the needs assessment to determine the exact content and structure for the professional learning partnership. Kick-off with the leadership team and teacher group to seed the work. Cyclical ongoing face-to-face support across the year including facilitated learning walks, leadership coaching, and cohort teacher group facilitation and possible teacher professional learning. Ongoing virtual consulting for principal and/or leadership team. More-nuanced teacher content-learning work and/or an additional cohort of teachers. Create and sustain a teacher learning culture of collective efficacy beyond the cohorts. The Leadership Guide for K-12 Teacher Professional Learning provides practical guidance for leaders, whether they are making the case for transforming teacher learning in their setting, implementing a sustainable approach, or seeking support for scaling and extending effective practices. 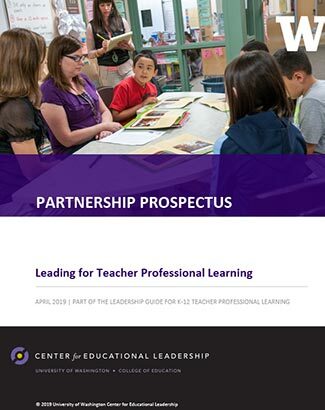 Interested in bringing CEL's Leading for Teacher Professional Learning partnership to your school system? Read our partnership prospectus, then fill out this form and we’ll be in touch to discuss a plan and budget tailored to your needs.